Congratulations! You’ve found a new person to join your startup in the Valley. You found them outside the area, so now you’re moving them so they can join your team in your office. They’ve signed their offer letter and booked their flight, so all you need to do is get their desk ready and a set of keys to the office, right? Wrong. If you really want to help your employee succeed and build a strong relationship with them, you need to understand there are many needs you should try to help them with beyond the office. The key to understanding what your new employee faces is to follow Maslow’s Hierarchy of Needs. Most people join a startup for Levels 4 and 5, because they bring opportunities for more rewarding and interesting work than you’ll find at a big company. It is likely many of the keys that convinced them to join your company play to those desires. The problem is, when you move, Maslow’s Hierarchy is flipped on it’s head; your basic life needs of safety, shelter and belonging are all wiped out as you leave those things behind in the last place you lived. 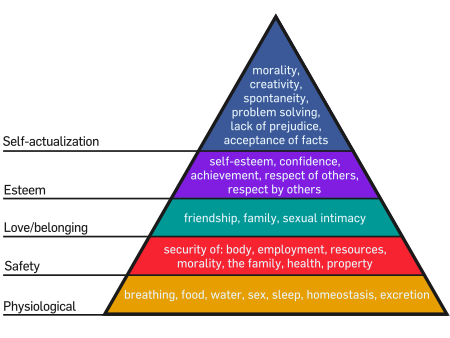 Maslow made his list a hierarchy for a reason; you don’t care about Self-Actualization and Esteem nearly as much when you don’t know where you’re sleeping at night or have no friends. Having moved to SF just 4 months ago, I’ve had to rebuild those first three levels (to varying degrees of success). I’d like to share my advice for a founder importing talent so their employees can have an easier transition. When you move to a new city everything is uncertain. Where will you live? How will you get to work? Where do you buy groceries and other household items? Your most basic needs are up in the air, which will mess with even the strongest individual’s psyche. If you’re moving as a young adult, chances are you’re going to be moving out here and then starting your search for an apartment. Especially in San Francisco, nothing could be more stressful. Even if you’re lucky enough to have a friend’s place to stay, most people feel uncomfortable putting their friends out and even the best friends are going to be grimacing if a stay with them drags on very long. What should you do for your employee? In my last post in the SF Startup Survival Guide, I captured all the advice I learned in finding an apartment in San Francisco. There’s a lot that would blindside even a veteran of living in big cities, so the first thing would be to pass them posts like that and adding any advice from your coworkers. The latter has the bonus of being a great opportunity for a new employee to bond with a coworker. Also realize that you should have your employee focus on finding their place to live. They will not be able to focus on their jobs while they don’t even know where their bed is going to be. If they’re like I was, I moved because the job was an opportunity to punch above my weight class which made me eager to prove myself. That came in direct conflict to taking time off to look at apartments, but Hiten (CEO of the company I work at, KISSmetrics) wisely encouraged me to, “do whatever you need to.” It was 10:45am on a Monday that I found my apartment, the second one I had looked at that morning. If you only search on weekends, it will take forever to find anything given how competitive the market is and drag the stress (and productivity loss) on much longer than it needs to. Once you have the bare essentials of a roof over your head, your concerns shift to figuring out how to start building your life here in town: settling in, building routines and getting the items you may have discarded before moving. San Francisco is a decently safe city…except where it isn’t. A newcomer could be fooled by the high end stores on the borders of the Tenderloin and City Hall and Opera in Civic Center. These are not places to be in at night without your wits about you. It’s also an expensive city that can quickly shrink your bank account. Make sure they have what they need and know where to go for things. Don’t assume anything. Showing you care beyond their ability to ship code or execute on marketing plans not only shows you’re not a selfish leader, but it will score major points with them. Those points matter a lot in the competitive employment environment here; it won’t be long before they’ll be meeting other startupers that would be happy to hire away your talent. On the financial front, realize it is quite expensive to move. Based on my own experience and talking to others, it appears it costs an average of $5,000 to move an individual and upwards of $10,000 to move a family. This will put a serious dent in anyone’s bank account so if you can offer a relocation package, expect it to need to hit those numbers to cover someone’s costs. If you can’t offer one (I didn’t get one at KISSmetrics), realize the importance of that first paycheck and make sure that they’ll receive it on time and as expected. When you move to a new city, you’re leaving behind many of your friends and often much of your family, too. We’re all social creatures and by making a big move, you’re essentially cutting off much of your natural support system. As I’ve talked to others who are also transplants to this city, this seems to be the dirty secret no one wants to talk about; nobody wants to admit they have no life outside work (and not by choice). Within my first two weeks of moving out here to SF, my father had a heart attack scare (thankfully a false alarm) and my grandmother (last living grandparent) was diagnosed with terminal cancer (she passed May 15, 2012). Piling on top of all the other things I was dealing with settling into SF and having no one close to talk to, it almost broke me. It didn’t help SF is 3 hours behind the West Coast so I couldn’t talk to friends and family before work (I was asleep) or after (they were asleep). Luckily, Hiten noticed there was something up and took a more active role and interest in my well being. We got dinner a number of evenings, which helped me have someone to talk to and led to us talking through my challenges. We then worked on some ideas on how I could handle things better, which included visiting my grandmother, taking some time off and being more strategic about how I settle in. Your employee has a roof over their head and has started to settle in to the basics of life. Your work here is done, right? Wrong. A depressed or lonely employee will not be nearly as productive and engaged as one who is happy inside and out of the office. But what can you do? You can’t be their BFF, but you can help. As Hiten did with me, you should give extra attention to see how your new employee is doing in their first couple of months. Make it okay for them to talk about what they’re struggling with. The Friday off Hiten gave me after I told him about my dying grandmother was exceptionally helpful and built a lot of trust. Beyond dealing with personal crises, the best thing you can do to help a new employee is have them make a list of all the things they loved most where they lived before. I did this and it helped tremendously. I realized that I really missed playing on sports teams, playing poker with my startup friends, seeing movies in theaters and “Scotch day” with my roommate. Armed with a list of things I missed, I could start picking off what I missed doing. Your other employees can likely help out with this (I relied mainly on Google) and recommend the sports leagues they know about (I play in Bay Area Disc for Ultimate and Sports4Good for Socccer), sites with things to do (Zach Cole helped me find Sosh) and anyone they know that might share similar interests. SF has much to offer regardless of your interests, which definitely helps. If you’re at an early stage startup, everyone is likely working long hours. That makes it all the harder to make friends as you don’t have a lot of free time to work on building those relationships. Recognizing this, building a culture of “work hard, play hard” can help, by ensuring all your employees have time to have fun and potentially become friends outside work, which has obvious ancillary benefits. Hiring someone new to your team is more than adding an asset like a printer or computer; remember they’re a living, breathing human with hopes, dreams and needs. In this competitive environment, showing the extra effort to care about your employees beyond the work they produce can have a huge impact on your culture and retention. And if you’re new to the city, know you’re not alone. Life has gotten a lot better than my first few weeks here, but I still have a long way to go to replace all the things I miss most about my life in Boston. If you want to grab coffee or a beer, know any casual poker games or have an affection for good scotch or movies, let me know. « Older Post 11 Books Every Entrepreneur Should Read	» Newer Post Should founders care about their employees’s personal lives?